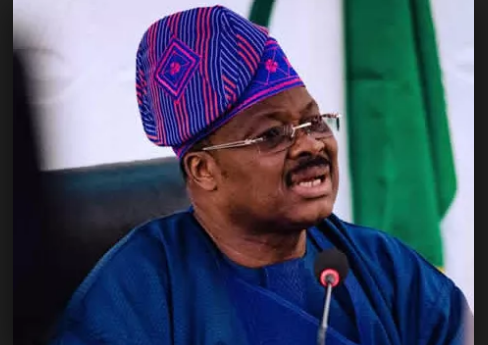 There is confusion in the Oyo State government following the loss of a sum of N357million while it was being conveyed to some banks in Ibadan, capital of the state, according to SR's report. Sahara Reporters understands that the man who drove the vehicle, an old man known as ‘Baba Obe’, is a trusted hand, as he has been around the Ajimobi family for decades. In fact, he drove Ajimobi’s father, who was once a member of the Old Western Region House of Assembly, for a long time in his lifetime. These days, he drives Ajimobi's last born. SR understands that the man detailed to oversee the movement of the money, simply identified as ‘Semiu’, was wounded during the attack, his head hit with a gun; and that the money was passed on to her by Damola, a personal assistant to the Governor’s wife who is also the daughter of Segun Bolarinwa, Special Adviser to the Governor on Security. When SR contacted Olugbenga Fadeyi, spokesman of the Police in Oyo State, to ask if he was aware of any robbery incident at Ring Road, he said he wasn’t. But he asked for an hour to find out. One hour later, Fadeyi confirmed that no such official report had been made. The Oyo State government has been in the news lately for unpleasant reasons relating to shady movement of funds. In March, part of over N1billion moved out of the State House by Ajimobi between the night of Friday 22 and Saturday 23 was confirmed missing. Two days later, SR reported that Ajimobi suspended Mr. Niyi Ajao, his Special Adviser on Information and Communication Technology (ICT), without pay for mismanaging election campaign funds. Only last week, Godwin Obode, former Special Assistant on Youth and Student Matters to Ajimobi, was arrested by men of the Federal Special Anti-Robbery Squad (F-SARS) following his refusal to return the N18.5million he received from the APC in Oyo State for the elections but did not spend.